As the final scene played out in the 11/27/11 episode (Pretty Much Already Dead) and Rick was forced to shoot Sophia, I immediately thought of a classic movie I watched years ago. The moment was so reminiscent of Old Yeller that I am afraid this blog post may be telling people what they already know, but I simply can’t discuss the two and how they relate. Old Yeller, released by Disney in 1957, is based on the book of the same name by Fred Gipson. Set just after the Civil War, it is the story of a rural family and the dog that wanders onto their property. Younger son Arlis loves the dog. Teenage son Travis, the man of the house while his father is away, immediately dislikes the dog, but ends up developing a close bond with it. Yeller is bitten by a wolf while protecting Arlis and the dog contracts rabies. In what is often described as “one of the most tearful scenes in cinematic history,” Travis must put Yeller down, both to put the animal out of its misery and to protect his family. Travis knows that you have to live up the responsibility thrust upon you and do what needs to be done whether you want to or not. Sometimes that means shooting your own dog. In doing so he leaves behind the boy he was and becomes a man. Like Travis shooting Yeller, Rick steps up and puts Sophia down. He does what we’re not sure we could do. We all thoughtlessly yammer on about how “I’d shoot every walker; I don’t care if it was my Mother,” but this scene forces us to question whether we’d really have the stones to do it. Could we be that kind of man? Even as the scene brings us to those questions, it shows the kind of man Rick truly is. He feels to blame for Sophia having been turned. As much as it hurts him, as much as he doesn’t want to do what has to be done, Rick shuts down that emotion and lives up to the responsibility thrust upon him. This is the mark of a true leader, of a real man. He does what Shane talked so big about being able to do while teaching Andrea to shoot. Shane yelled at Andrea to turn off her emotions and take the shot, but was unable to take the shot himself when doing so was crucial. When Sophia emerges from the barn, Shane bows his head and does nothing. Rick, who had been on the sidelines in this scene, moves figuratively and literally from observer to participant. He sets his jaw and casts his eyes sideways, in what appears to be Shane’s direction, seeming to acknowledge his duty. He then steps forward, unholsters his Python, and does what has to be done. He shoots his own dog. This act is part of what sets Rick apart from Shane. Shane is an immature teenager, trying to get everyone to follow him into action by forcing a confrontation with Herschel and Rick about the barn walkers. Rick is a man, trying to stop Shane’s ill-conceived plan and when that fails, stepping in to clean up Shane’s mess. Shane will never be half the man Rick is. Andrew Lincoln played the scene well, probably better than any other we’ve seen thus far. 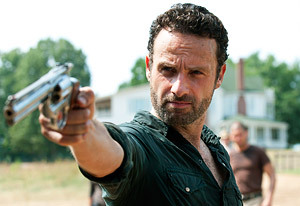 Lincoln's shifting facial expression - as Rick steps forward and draws his weapon - emphasises the enormity of the action that Rick's sense of responsibility requires him to do. The resignation rolled across his face like a storm cloud rolling across a clear June sky. His face showed - more than any dialogue could tell - that Rick was at a turning point. Does this indicate the much hoped-for shift from the overly cautious, often unsure of himself man we’ve seen in the TV show (childhood) to what readers of the graphic novels say is a much more decisive leader (adulthood)? I hope so. I look forward to a Rick who has more confidence in his leadership abilities, but he still tempers himself with compassion, maturity, and purpose. Excellent post Lisa~ Agree 100%. Like the shooting scene from Old Yeller, the end of TWD was painful to watch yet showed a deep strength in doing what needed to be done! Those scenes were heartbreaking & I cried through both. Let me be the first (and maybe only one) to admit that the final scene made me cry. I agree with you about the comparison Lisa! Well done once again Lisa. It was an excellent episode and I agree entirely about the depth of emotion that Andrew Lincoln displayed in the final scene. Some people have been discussing wheather we will see him get more angst ridden, but I hope that this is the catalyst that sets him up as the true leader he has the potential to be. Shane showed that for all his bravado, he could not deliver on his promises. Time to fold up your tents and mosey on down the road Sheriff! I feel the one thing that differentiates Rick and Shane is compassion. Rick has compassion toward people, whether living or dead. In Season 1 Episode 1, he put the half-bodied walker out of her misery and even said "sorry" to her for what she has become even though how the world has changed isn't his fault. And even now when he has to shoot Sophia, it is with compassion that he does it. It's a difficult choice. To let little Sophia die with some dignity as a human and allow people to remember her as a human once (shooting her before she starts a biting rampage) is compassion. this programme is just about the best thing ever on tv...immaculately made and performed, it keeps me wanting more....I wasnt sure if the second series would be able to measure up to the first, but i neednt have worried, in some ways it has surpassed it. The mid season finale was devastatingly horrific, i'm sure i wasnt the only one who felt their heart sink when sophia lumbered out of the barn...just heartbreaking, and the actors really brought it home with their performances!